ANDY Gee, thanks Santa. You know Iâ€™ve been good this year, donâ€™t you? â€œSANTAâ€ Actually according to the efficiency reports that Nadiaâ€™s been showing me. It seems that youâ€™ve been spending way too much time disrupting the office with your insanity. You can be expecting a one-on-one meeting with Nadia very soon. ANDY But tell me the truth, Nadia is really Mr. A isnâ€™t she? 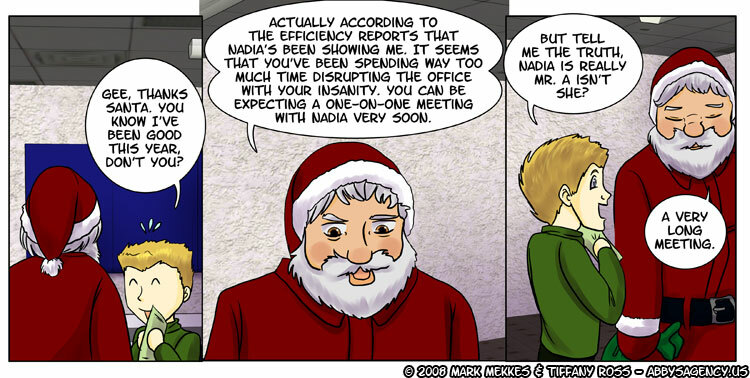 â€œSANTAâ€ A VERY long meeting. Rofl. He doesn’t get it, does he! Expecting the following line in a strip or two.. “We work for SANTA? !” Also expecting mention of elves..